IF you liked Katalyst's debut album album Manipulating Agent, you're sure to feel the same was about the Sydney producer's latest release. 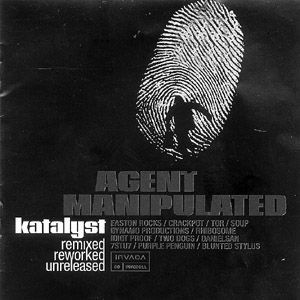 Titled Agent Manipulated, the album is a follow up to the debut and is a collection of tunes inspired by tracks on Manipulating Agent. Katalyst has enlisted the creative skill of some of Australia's best producers to cut'n'paste a collection of tracks offering a fusion of funk, soul, breaks and hip hop. The opening track Uprock This puts Katalyst in control and as the album's first single, it is also easily the standout track. Mixing together old school funk and hip hop with horns and a big soulful voice, the track is classic Katalyst. Katalyst returns on Tell No Tales and Dangerous, but offers some darker sounds. Perth based Rhibosome pick up the pace with an atmospheric drum'n'bass mix of Cycle. Blunted Stylus, originally of the Resin Dogs, puts a fresh slant on Fusion and offers chunkier beats as does Dynamo Productions' mix of Showtime. Other guests producers including 2 Dogs and Koolism's Danilesan. The album is the perfect party ingredient and Katalyst is sure to get the crowd moving when he supports Ben Harper at Newcastle Entertainment Centre on Saturday night.